Soon after Black Friday, SealsWithClubs was one of the first online poker rooms that offered players all over the world a legal way to play online poker for real money using Bitcoin. While we didn’t see many seals at the tables, there were more than enough fish to keep the action going and the money flowing. SealsWithClubs is accessible to everyone and currently only accepts Bitcoin as a way to deposit and withdraw from the site. Let’s start with the rake. For all NL and PL cash games the rake is 2.5% capped at 0.01BTC – this is 50% less than the industry standard. All limit games are raked at 1% capped at 0.007BTC. There are usually around 200-500 people playing cash games with approximately 30-60 tables running depending on the time of day. The lowest cash game stake is .10/.20 of a chip. Each chip at SealsWithClubs is valued at 1/1,000th of the value of a single Bitcoin. For example, 50 chips is 0.05BTC. Please bear in mind that most of the cash game action is at the microstates level. The biggest MTT runs each and every Sunday and is a 500 chip freezeout with a 20BTC guarantee - players can buy-in for 0.05BTC. There is no way to satellite into any MTTs, the site offers no late registrations or re-buy MTTs for any of their tournament games. If you don’t own any Bitcoins that’s no problem, once a month SealsWithClubs offer a MTT freeroll with a 10BTC guarantee. The fields are pretty low and fishy so there is a good chance of making it into the money. Alongside that they also have hourly turbo freerolls where players can win 50 chips. 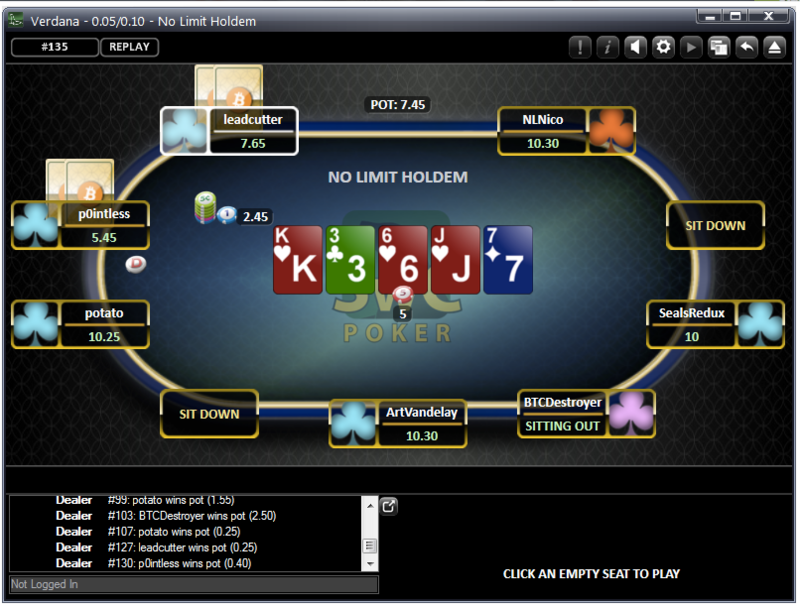 The site has various SNGs game formats (6max-9max, 180mans) but only offer them in NL Hold’em. Once again most of the SNGs that run are at the lower stakes. The support is pretty solid, you can contact via email or Twitter. They have an active Twitter account and usually respond to all queries within 24 hours. Next to no personal information is required when depositing. You are only asked to create a username and password, giving your email address is totally optional. There is no need to hand over any personal information when setting up an account. You can deposit by scanning the QR code offered on the deposit page or send payment from your Bitcoin wallet to their cash-in address. The cash-in address can be copy and pasted from the deposit page. Deposits are made instantly with withdrawals taking around 20-30 minutes. For a fairly new online poker casino, SealsWithClubs is providing something many others sites lack – low rake and playable software. With a decent player pool of regulars and recreational players, there is certainly value to be had in depositing money, oops we mean Bitcoins at SealsWithClubs.